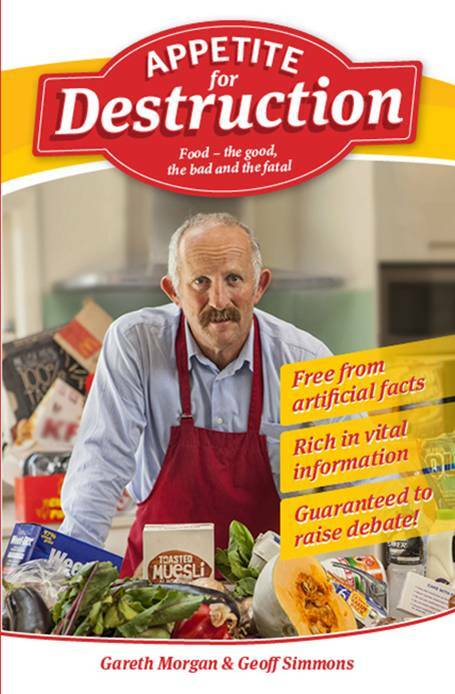 Gareth Morgan is known as a smart economist and a bit of a stirrer of public debate. Think domestic cat control to save birds. Think “Big Kahuna” on social policy. And think “Health Cheque”, a review of prioritisation in the health services. But he, and his economist co-author Geoff Simmons, actually apply a very careful analysis before they get in your face with their solutions. “Appetite for Destruction” is an impressive book. It is based on a strong analysis of the theory and science of food. There are likely to be a few quibbles about occasional facts and hypotheses, but standing back the overall analysis is sound and compelling. Released tomorrow, the book reviews aspects of the history of food, how the current foodscape is an amazing success story of capitalism (high energy, long shelf life, ‘fake food’ cheaply available wherever you look) but also a catastrophic market and public health failure (why should fake food be easier to buy, prepare and eat compared to healthy food?). 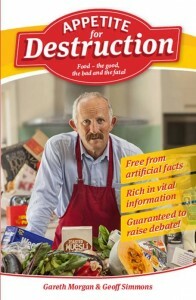 Morgan and Simmons, through their blokey-banter and colourful turns of phrase, may change the minds of many middle-New Zealanders from a belief that what you eat is individual choice, to a more nuanced understanding that what we are offered and induced to eat is highly influenced by the food industry. Moreover, what we eat is out of keeping with what a society needs to sustain a healthy culture and nation. 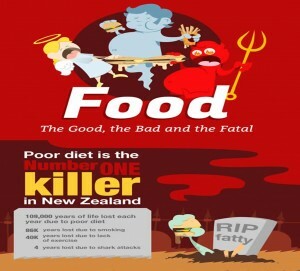 A society that entices and reinforces unhealthy eating and obesity, with attendant premature deaths, excess disease, high health system costs and social impacts is surely not the sort of society most New Zealanders want. But it is what we’ve got, by virtue of the fabulous unintended consequences of a global food market and technological progress. how the little white powders of salt and sugar have become so integral to food production (they ensure long shelf life, and flavour over all sorts of nasty tastes), yet they are killing us while keeping our taste buds titillated. I enjoyed this historical look back, to understand how we got to where we are now. and a carefully crafted package of subsidies and taxes on foods – I agree, but with the emphasis on ‘careful’. The science is actually very tricky and uncertain, as we will blog about on Thursday this week. In theory, a new PHC seems great – even ‘rationally’ obvious. But I just do not think it will work in modern-day New Zealand. We are too small a country to have such a separate agency independent of Government, and between the Ministries and providers. Pharmac has succeeded in this space, but they have had a very clear focus (drugs, and now also devices) which whilst contentious at times have nothing like the contention and (necessarily) political heat of healthy eating and physical activity (and tobacco and alcohol). Final verdict? Great book – but still bits to argue about. Bound to get lots of attention. A great example of what kiwi-style philanthropy can do to nudge and cajole and reorientate public and political thinking on one of the great public health policy issues of our time. Declarations of interest. Tony Blakely conducts research on food and health eating environments, including some of that cited in the book. He was not interviewed by the authors during the writing of the book, but has been in discussions with Geoff Simmons since the book was sent to the publisher. Tony Blakely has no financial interest in the book, or the Morgan Foundation, and has received no funding from the Morgan Foundation. This entry was posted in Uncategorized and tagged diet, healthy culture, healthy eating, Pharmac, well-being by Kate Sloane. Bookmark the permalink. Point well made about how personal intervention should be more effective in a supportive environment. It is difficult as researchers to precisely quantify the separate effects of, say, dietary advice, taxes/subsidies, labelling, etc. But in reality, and in theory, we would expect the combined effects of such a package to be ‘bigger than the sum of the parts’. This present a worthy challenge for research, and a conundrum for policy makers! That all said, I think (and the evidence would support) that population-wide action is likely to dwarf personal education in impact in areas such as healthy eating. But there will still be a demand for personally delivered interventions, and (from where I sit) that will also hopefully build more support for population-wide interventions. (We need public support in a democracy!) So it is mutually reinforcing.